I Am Breathing will raise awareness to mark Global Motor Neurone Disease Day on 21st June, launching with its UK Film Premiere at EIFF on 20th June. Critically-acclaimed feature documentary I AM BREATHING will raise money and awareness for Global Motor Neurone Disease Awareness Day on 21st June 2013 through a global screening day, launching with the UK Premiere at the Edinburgh International Film Festival the previous day (20th June 2013). Scottish Documentary Institute (SDI) and the Motor Neurone Disease Association (MNDA) will collaborate to promote awareness and raise funds with cinema and community screenings of the film all over the world on 21st June 2013. Participating so far are the Balkans, Australia, USA, Finland, Denmark, The Netherlands, Russia and New Zealand. I Am Breathing is the hard-hitting story of Neil Platt – a thirty-three-year-old Yorkshireman who contracted Motor Neurone Disease. Paralysed from the neck down with only months to live, he tells his story to help raise awareness around his devastating disease and dedicates the film to his one-year-old son Oscar. Collaborating with filmmakers Emma Davie and Morag McKinnon on I Am Breathing, he used his remaining months to communicate about his illness. He also wrote a blog and committed himself to playing a part in making MND history by inspiring a community of people to join the fight. 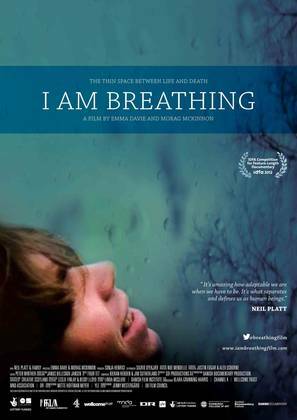 I Am Breathing is a co-production between SDI Productions and Danish Documentary, with investments by Creative Scotland, Danish Film Institute, Wellcome Trust, MND Association and the former UK Film Council. Broadcasters involved in the production are Channel 4, DR (Denmark) and YLE (Finland). We are a membership organisation with nearly 8,000 members forming a powerful national and local network that provides information and support alongside fighting for improved services. We now have over 3,000 active volunteers in England, Wales and Northern Ireland and 140-plus paid staff, all dedicated to improving the lives of people affected by MND, now and in the future.